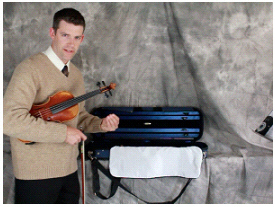 Brooks Hanes (pictured above), the founder of I Can Play Violin! offers the Violin Learn-A-Song-A-Month Masterclass which teaches children 3-11 one song per month. The Masterclass comes in a DVD format, is mailed to your home, and is complete with practice and playing tips, plus guidance regarding the song chosen for that month. It’s a great supplement for kids already taking lessons–it works as an add-on to private lessons, and is great for summer-time practice as well. AND, if you’d like private lessons with Brooks Hanes, that is a possibility in the very near future. First, try one of his Masterclasss DVDs—you can do so for free (just pay $4.97 for shipping). See his entire free offer here (it’s pretty impressive!). Parents should watch the DVDs with their child (ren)—and give 5 minutes of undivided attention during practice time. The teacher makes mistakes! He admits his mistakes! He smiles at his mistakes! Clearly, if this professional musician makes mistakes—my children realize they’re going to make them too. Maybe they can smile at their mistakes as well! He discusses, he explains, he claps out the melody, he shows finger position, he plays the piece in a variety of ways—he’s very thorough. Kids love getting mail—and they love being able to play NEW material. This program combines the two! Genius! And btw, Mr. Hanes suggests you let your kids get the DVD from the mailbox—this is much more fun than just seeing it on the kitchen table! Mr. Hanes will even make sure he addresses the envelope to your child(ren) if you e-mail him with the name(s). That’s a nice personal touch! This is mentioned above—but it’s worth mentioning again–because the program comes on DVDs, your kids can self-pace—rewind as necessary, practice something over and over again, if they’d like. A newsletter accompanies the DVD—more inspiration, and great tips and tricks for parents (things I wouldn’t have thought of!). In this month’s newsletter—If you’re not at the level that you want to be, the only thing separating you from that level—that beauty—that technical prowess—is PRACTICE. That’s where I Can Play Violin! comes in. We’re here to help you ENJOY practice to the point that it becomes daily routine…not a big deal…part of the schedule…enjoyable! You can start or cancel at any time.